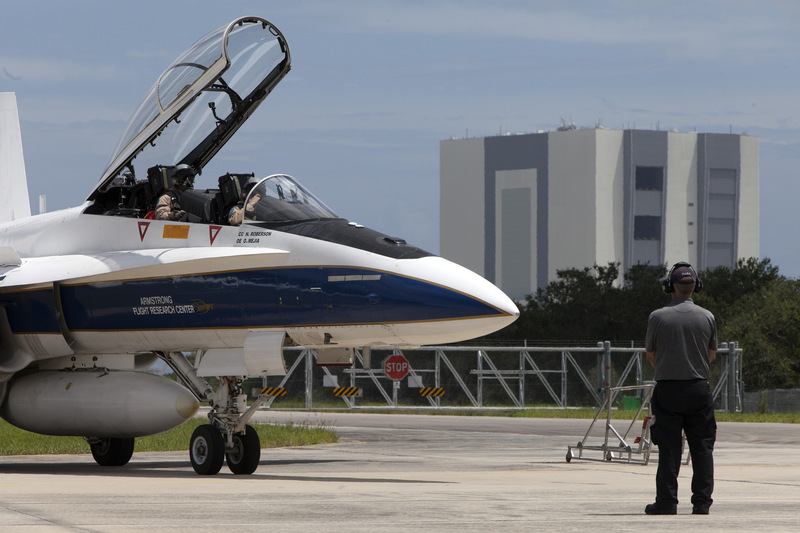 A NASA F-18 jet is prepared for takeoff from the agency’s Shuttle Landing Facility at Kennedy Space Center in Florida. Several flights a day have been taking place at the spaceport in order to measure the effects of sonic booms. The testing is part of NASA’s Sonic Booms in Atmospheric Turbulence, or SonicBAT II Program. NASA at Kennedy is partnering with the agency’s Armstrong Flight Research Center in California, Langley Research Center in Virginia, and Space Florida for a program in which F-18 jets will take off from the Shuttle Landing Facility and fly at supersonic speeds while agency researchers measure the effects of low-altitude turbulence caused by sonic booms.